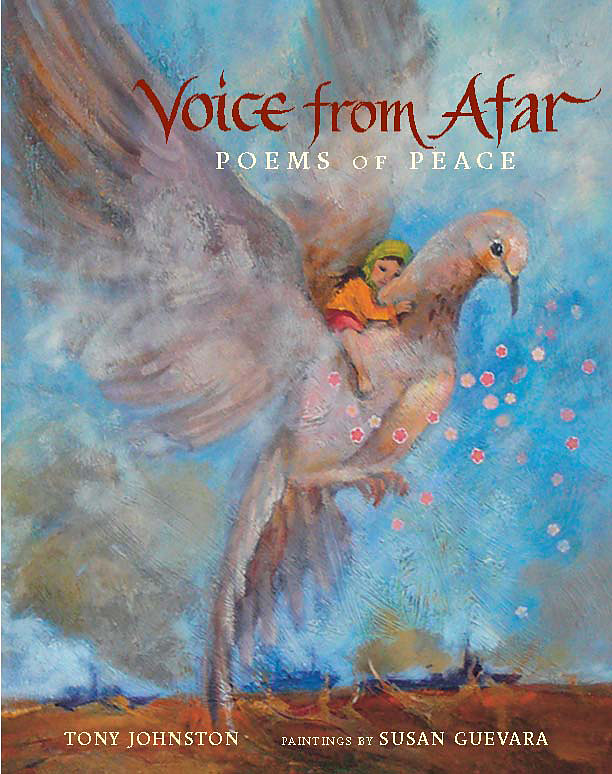 Timely poetry collection about peace and war by acclaimed childrens’ poet and author, Ton Johnston, stunningly illustrated by Susan Guevara. The poems in this collection present haunting images of war and peace. Set all over the world, form Belfast to Africa to the Middle East, these lyric snapshots show the effects of war on ordinary people, as well as the hope and cautious joy that mark each person’s journey to survive. The poems startle with a quiet power: a sister makes up a sweet story for her brother about their house flying away from gunfire: a lentil is wryly asked to fling itself into boiling water so that a desperate family can be fed; a stubborn rosebush blooms, because no matter what it must endure. Full of sweeping, vivid color and emotion, Susan Guevara’s accompanying acrylic paintings astonish, move, and provide a fascinating interpretation of and tribute to Tony Johnston’s peace.